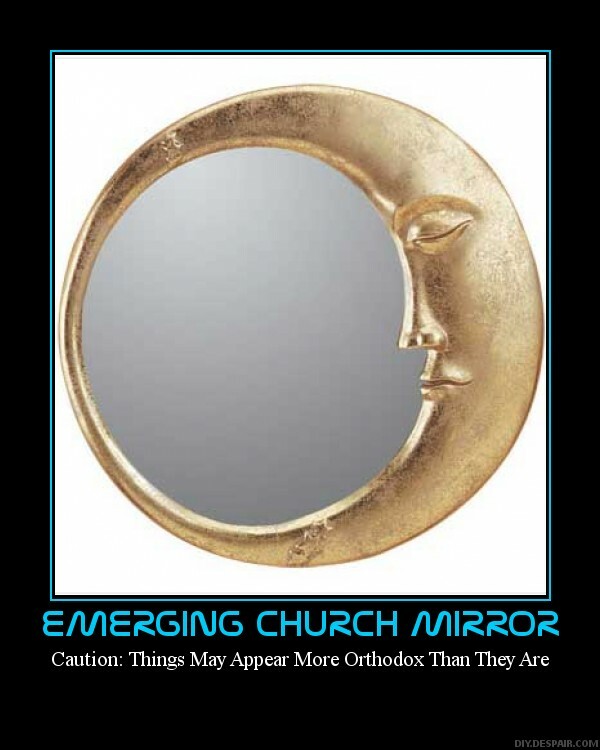 Apprising Ministries has been telling you in recent posts such as The Emerging Church, Philip Clayton, And New Progressive Theology and Brian McLaren And His New Emerging Progressive Theology that, right within mainstream evangelicalism, the Emerging Church continues developing into a full-blown cult of a new version of Progressive Christianity. I’ve been warning you that they’re busy “doing theology,” which is their term for bantering ideas back and forth—that may or may not have anything to do with the Bible—to try and come up with the way their “big tent” Christianity is to be shaped. The term big tent itself really concerns the universalism which forms the rotten core of this pseudo-Christian neo-liberalism that they’ve taken to calling Emergence Christianity. I’ve also told you that Emergent Church guru Brian McLaren has now begun laying it out systematically, through the answers to the “10 questions that are transforming the faith,” in his new book A New Kind of Christianity (ANKoC). What needs to be understood here is that with the EC you’re essentially dealing with people who’ll just continue on pushing the envelope much the same way as a “know-it-all” teenager often does. Resisting the urge to wrestle with the serpent, let me simply say that I’m not at all surprised to find progressive Christian historian Diana Butler Bass, yet another Red Letter Christian, on The Beatitudes Society Advisory Board; peas in a corrupt spiritual pod. For now though, let me point you to EMERGING CHRISTIANITY: HOW we get there determines WHERE we arrive: Albuquerque, NM where TBS promotes an upcoming EC conference to be put on by Richard Rohr’s Center for Action and Contemplation (CAC) featuring Bass, Brian McLaren, as well as their fellow Red Letter Christian Shane Claiborne. Traditionally, this dimension of Hegel’s thought has been analyzed in terms of the categories of thesis, antithesis, and synthesis. Although Hegel tended to avoid these terms, they are helpful in understanding his concept of the dialectic. The thesis, then, might be an idea or a historical movement. I’ve told you before that those touting this Emergence Christianity see it as the sythesis now being birthed through its purer form of progressive Christianity currently being cobbled together e.g. by progressive theologians like Harvey Cox along with progressive/process theologian Dr. Philip Clayton through his Transforming Theology (TT) project. Another EC notable assisting would be the heretical Tony Jones, progressive theologian in residence at the church of universalist Emerging Church pastor Doug Pagitt, who contributes the foreword to Clayton’s latest book is Transforming Christian Theology. Did you catch that; a broad road of religion wide enough that “Evangelicals, Charismatics, Mainliners, and Roman Catholics” can enjoy it together. Well, McLaren actually left out another group whom Clayton, who just put on the Theology After Google heresy-fest, also invited to give his TT project input as well: The non-Christian cult of Unitarian Universalistism. Lately I’ve begun showing you some of the beliefs now emerging from this new progressive EC ooze of “big tent” Christianity, which Rohr and McLaren et al are advancing as their “new theology rooted in the ‘third way’” of a neo-Gnostic mysticism. In closing this out, for now, the last conference put on by Rohr’s CAC was Following The Mystics Through The Narrow Gates. I told you we’re deep into the world of Humpty Dumpty language with this big tent progressive Christianity; that’s right, this new universalism has just been referred to as “The Narrow Gates.” It was basically going over material from Rohr’s latest book The Naked Now: Learning to See as the Mystics, or the great enlightened ones of each religious tradition, as Rob Bell the rock star icon of the Emerging Church said of them in his 2009 sermon I will say it again, and again, and again. Prayerfully evangelical leaders will finally cease their amazingly accurate impressions of Rip Van Winkle and will begin to see that this new progressive theology of the Emerging Church is as a huge serpent swallowing up every philosophy of religion; then mixing it with the panentheistism of classic mysticism, meanwhile adding in some evolutionary scientific emergence theory with their twisted belief they are evolving upward into a higher consciousness, and then regurgitating it back out upon the unsuspecting with their Humpty Dumpty doublespeak as somehow consistent with “historic” Christianity. Now you may go ahead and laugh if you want to; it’s ok by me, but I told you five years ago that we were dealing with neo-liberalism in the Emerging Church. And right now I’m telling you that if Brian McLaren is an evangelical Christian then I am the next Dalai Lama.